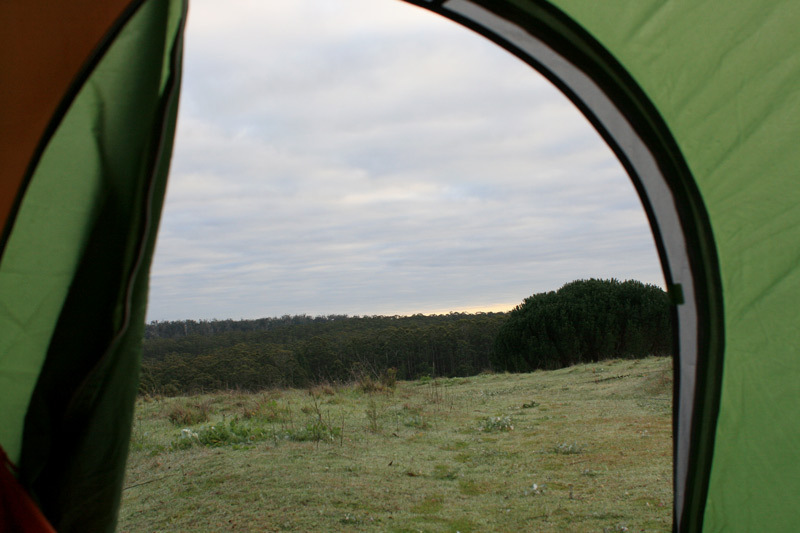 This morning I woke with the sun and excitably poked my head out of the tent reminding myself where I was – in the middle of the forest in Western Australia’s south west. It was quiet and not even a stir from the birds. I walked around briefly snapping a couple of photos of the morning scene and then climbed back into the tent, falling asleep for an hour or so. We were slow moving when we woke up again, our bodies slightly stiff from the previous day, and the tent was toasty warm inside I honestly didn’t want to leave the sleeping bag. Eventually, we collected our breakfast stuff, and walked up to the hut to see Sascha, the german guy who rocked up in the evening. He was awake, his bike all packed. He was travelling with panniers and we talked for a bit about his bike setup. It was quite the set up, he had this really cool generator on his wheel for charging electronics. Great idea if you are on the trail for a long time, albeit, there is limited internet connectivity in the area. We set up breakfast on one of the picnic benches on the verandah of the hut. The view across the clearing was picturesque, and the forest rooftop in the valley below was a nice reminder of yesterdays uphill conquest. The winter air was chilly however the sun was starting to warm us up, just a little. 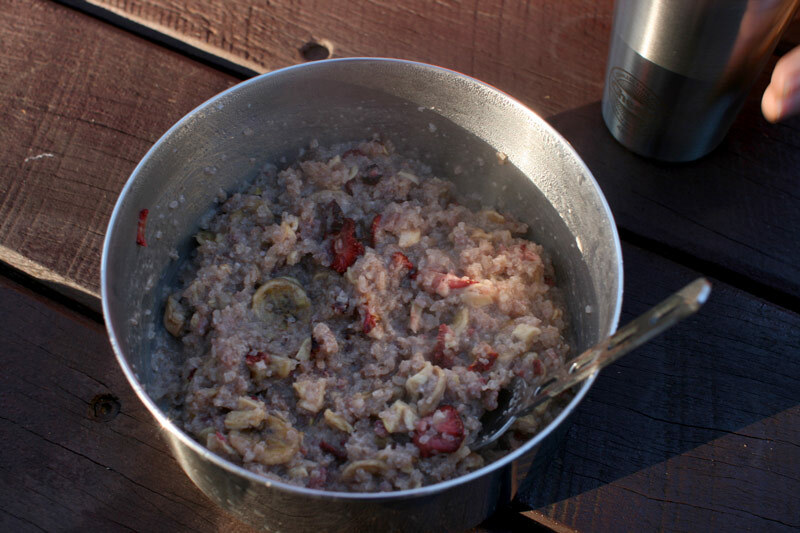 We brewed a nice strong espresso in the Kathmandu coffee press, and chowed into some warm coconut rice pudding with dehydrated strawberry and banana thrown in. Before the trip I dehydrated a large batch of food. It was a trial and error exercise working with drying times that turned out to be completely different to the dehydrator instructions. I’m glad to say that on Day 2 the meals thus far had been a success. Phew, because the only back up I had in case the meals were a disaster was beef jerky. The coconut rice pudding was my favourite dish and adding cinnamon, coconut sugar and maple syrup took breakfast to the next level! 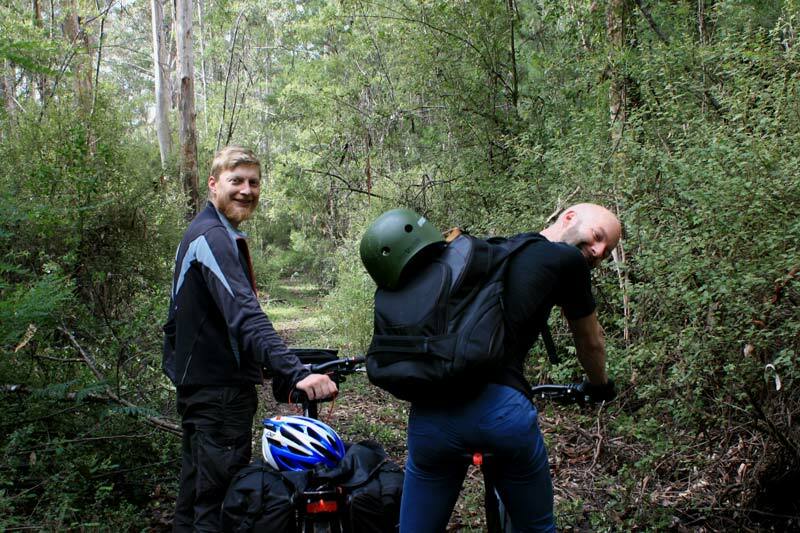 A quick consult of the trail map and we were happy to discover that it wasn’t going to be as challenging as yesterday; some uphill to begin with and then downhill and flat riding all the way into Manjimup. Woohoo! After the the intial uphill, along came the wide and straight downhill sections, and they were wonderfully awesome. I think I even cried ‘weeeee’ like a child being pushed high on a swing. The trailer added some decent speed to the bike too. One section of the trail we rode through an incredible forest tunnel tracing alongside a hidden brook. 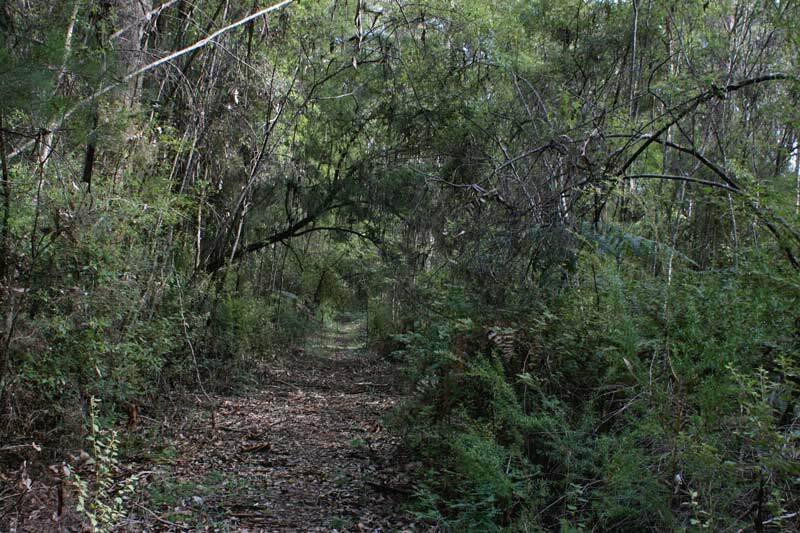 At some points the trail took us out of the forest and past avocado orchards and rural properties along winding pea gravel roads. It was nice to see the change of scenery today from yesterday’s cycle through densely covered forest with limited visibility past the trail. 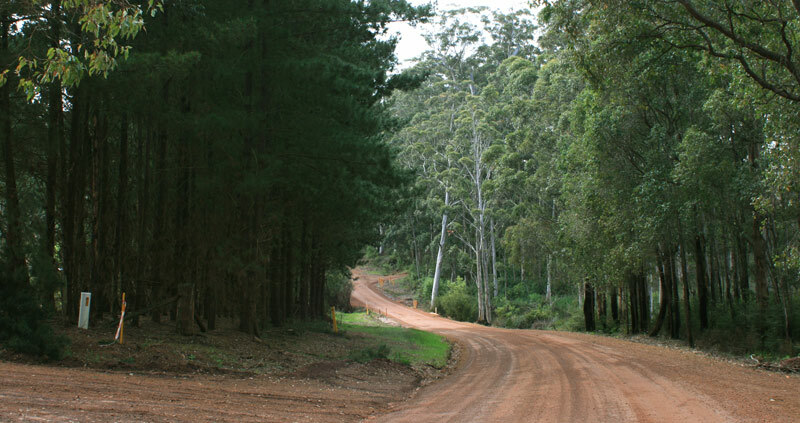 When we hit Dean Mill, a historical timber town close to Manjimup, the bikes roll onto lovely solid concrete bitumen. The first time in two days. We passed the local footy oval and from then onwards the path leads us straight into town alongside paddocks of dairy cows and sheep. The ride today was pleasant and following a rather mentally challenging day yesterday, we really needed pleasant. I was a couple of minutes slower than the boys and set the pace, but that’s the beauty of doing a trip on a trail like the Munda Biddi, there are no serious deadlines. Frequent snacks of chocolate and beef jerky kept us pedalling along during the day. 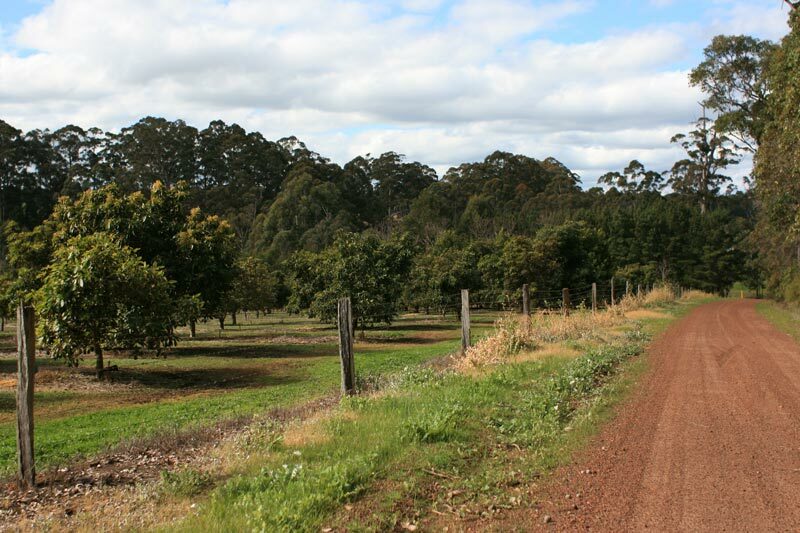 We arrived into the township of Manjimup earlier than originally planned at about 3.30pm. A bit of an odd hour in the town, too late for lunch and too early for dinner. 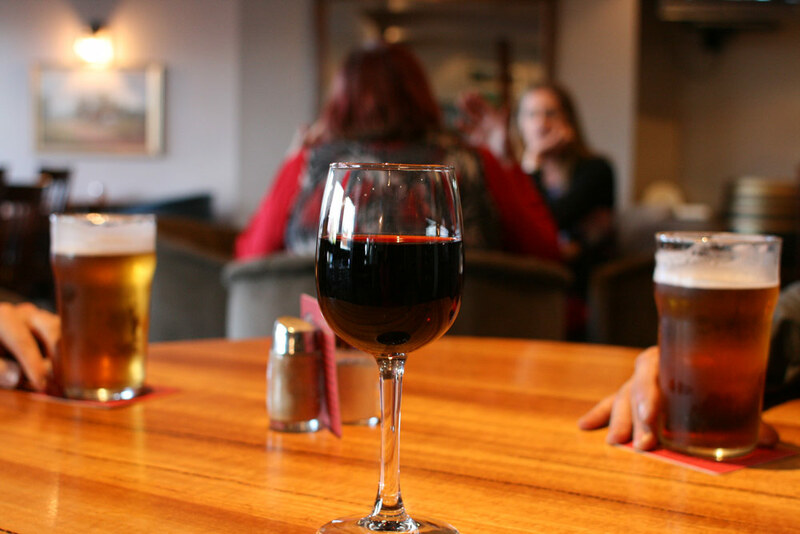 We decided a round of celebratory drinks at the local pub would be a great way to unwind. Most of the town folk were curious about the bikes and a bunch of locals hanging outside the pub thought we were absolutely crazy for riding in winter. I think I just heard the most choice words used in one sentence! We laughed it off and left them smoking and drinking outside the pub. To be honest, I haven’t really felt the cold, the riding keeps us warm during the day and the tent at night. So far it hasn’t rained. We say good bye to our new friend Sascha, he was staying in the local backpackers for the night before continuing along the Munda Biddi to Albany, another 486.80 kms. As I said yesterday, epic! He also has a blog that translates to Milk and Honey in English, and I’m looking forward to the read about his experience. 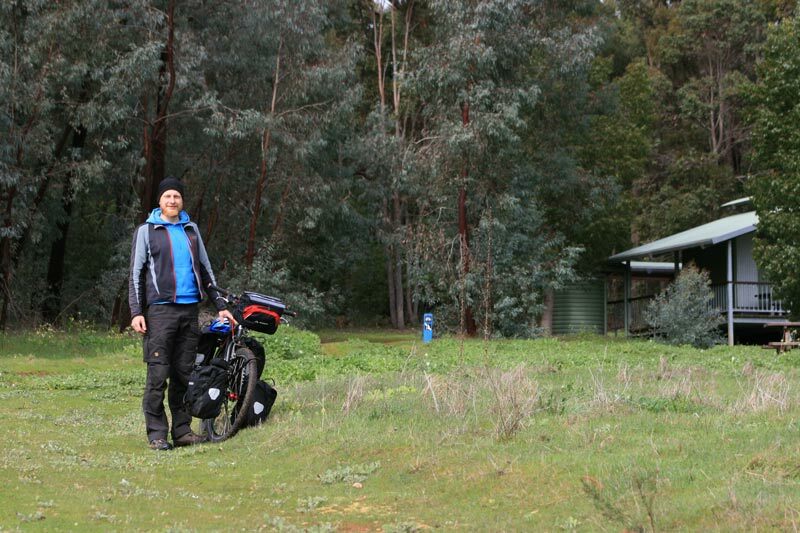 We get on the bikes, once more for the day, finding our way to Manjimup Caravan Park. Following a few entertaining questions for the staff at the park, we book an ensuite caravan site, which means, we have our very own hot shower next to the tent. We are glamping tonight baby! It’s a neat and tidy caravan park, nice greenery around. After we set up the tent, Derek makes a beeline for the deli located at the entrance of the park, I think he was over the dehydrated meals. He came back a little disappointed though, his burger wasn’t cooked to order and instead sitting in the bain-marie. It was little soggy. I was content with cooking up one of the dehydrated meals, mushroom rice again. 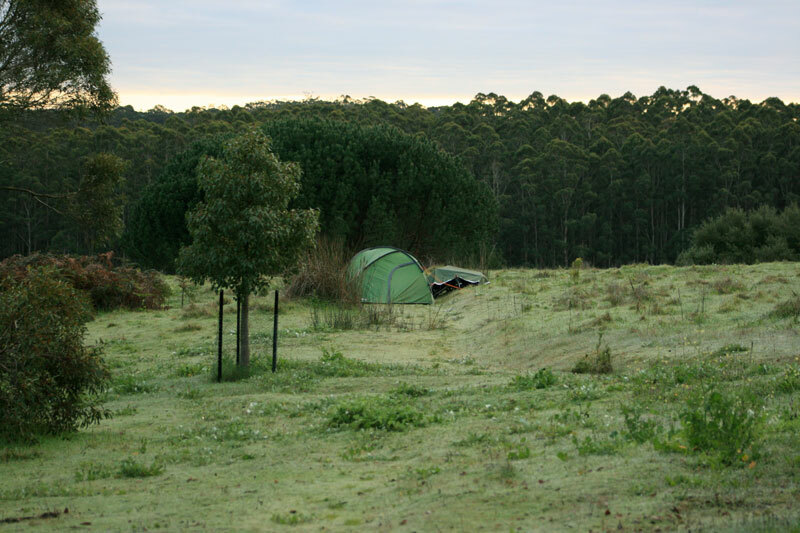 The caravan park sits on South West Highway and there is some traffic noise close to our camp site (Number 4). Before leaving on the trip, a few riders recommended ear plugs in the packing list. Now I know why. When you find yourself in town following a few nights in the quiet forest, you do need some. I think if we did our journey in reverse and spent the first night at the caravan park we probably wouldn’t have been so sensitive to the noise. We were so tired though that we fell asleep instantly. I woke up around 2am from a road train zooming past and tucked into a yummy rawsome lovebite slice. Not exactly a habit I’ve done before but hey, the body seemed to be wanting more food! That’s day 2 done! Stay tuned for our final day. Hope you have enjoyed.